Overlooks vineyards, large garden with private pool, perfect for families. 8m x 4m x 1.5m deep. Flat bottom with Roman steps. The table in the dining room will seat up to 8. The table in the kitchen seats up to 6. There is a separate laundry room which accommodates the washing machine and tumble drier. There is a utility off the kitchen with fridge, freezer, microwave oven, iron & ironing-board etc. The main living area is on the first floor, accessed by steps and is therefore unsuitable for wheelchairs. Smokers are welcome but please respect the house rules: Confine smoking to outdoors and use the ashtrays provided. Two families stayed for two weeks in August. Plenty of room for all of us. Meals on the terrace were a highlight. House is in great location. Quiet but only a short walk to the village centre (for fresh croissant and bread in the morning - yummy). The village centre will be lovely when the renovation is complete. It's only a short drive to the lovely town of Pezenas with supermarkets and shops. The house has everything you could want (though the one shower could use a little TLC). Owner and local manager both very friendly and helpful. Pool was very clean. We had a fabulous time. Thanks very much for your kind words and frank review. Pleased to say that the village centre renovations were finally finished in autumn 2013 (6 months overdue) and now looking fabulous. The shower too has had the attention it needed as well as a few other fixtures around the house. We rented this property for a month with family aged from 9 to 85 years! and it was suitable for all. Had everything we needed, and the owner was extremely welcoming and helpful. Loved the area and the village although there were a lot of pedestrian improvement works going on in the village during our stay. Would recommend this property to families of all ages. We had a brilliant time at this villa in Caux. The house was perfect for us, with plenty of space both inside and outside and a lovely pool for cooling at the end of the day. The village of Caux has everything you would need - butcher's, baker's, general store and a weekly market - all within a few minutes of the house. The locals were friendly too and always responded to our attempts to speak French. We found plenty to do in the area - a highlight was the excellent cycling on quiet and very smooth roads. You could choose between flat routes or hill climbs (including a Tour de France climb) - all within easy distance of the house. We also visited Marseillan, Sete, and the Med beaches, plus Pezenas, Collioure and Peyrepertuse. All excellent days out. We had with us a book called 'Notes from the Languedoc' by Rupert Wright - which turned out to be very useful as the author is writing about the area very close to Caux. He included cycle routes and descriptions of days out in the surrounding area. Communications with Mike prior to our visit and the instructions provided were excellent. We had no problems when we were there - but knew we could call on Niall if required. Overall we really enjoyed ourselves and have already booked to return in 2012. We stayed here with 2 other families for 2 weeks. All families had young children (aged 1-6). We all LOVED this house - it is in a beautiful and quiet location, and not overlooked by anyone, and yet on the edge of the (lovely) vilage Caux which has all the facilities you need on a day to day basis. The house was fully equipped with everything you need to cater for large groups - especially in the kitchen. There was lots of toys for the kids to play with - so much so that they prefered the house to going out!! The house was very spacious and with 11 of us in it - it didn't feel at all as though we were on top of each other. The area is very central to everything you would need on holiday -beautiful beaches, big supermarkets, the mountains, the lovely Pezenas... 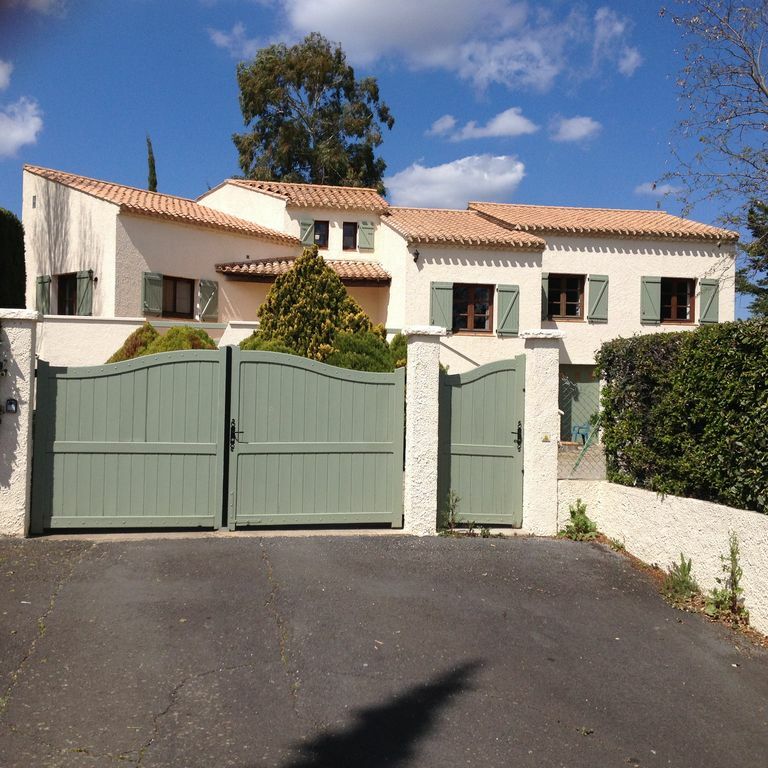 I would absolutely and totally recommend this house as the perfect holiday house in the Beziers area. We have been coming to the south of France for many years and we would rate our stay this year at No 6 as one of our best. The house is nicely located on the edge of the village with a view over the countryside and walks/cycles through the adjacent vineyards are lovely. We found the area had a pleasant balance of activities, with essential supplies available within walking distance in the pleasant and friendly village of Caux, to sightseeing and shopping in the old quarter of Pezenas, to 40 minute access to the sandy Mediterranean beaches near Agde and Sete. We had one or two minor issues which we stress would not prevent us returning. A little work is necessary in finishing off around the pool and consideration should be given to providing more in the way of bathing towels and an over-sheet to replace the duvet on very warm nights. Overall a most enjoyable holiday and we are delighted to recommend, the Owners for their pleasant and efficient handling of our holiday arrangement, the house and the location. Just 5 minutes walk from the centre of Caux and local facilities, pharmacy, 2 bakeries, butcher, convenience store, pizza take-away, 2 bars and a market on Friday mornings. The larger historical town of Pezenas is just 7 kilometres away and has 5 supermarkets on the outskirts, lots of upmarket shops in the centre and a huge Saturday market as well as an abundance of cafes, restaurants and bars. The Mediterranean coast is just 30 minutes to the south with a many and varied selection of sandy beaches and resorts. Choose between commercial , glitzy entertainment such as Agde or Vias or the more serene beaches of Marseillan Plage or Grau d'Agde with its wonderful floating restaurants at the mouth of the Herault River. Head north from the house and within 15 minutes you are in the mountains with any number of lakes, rivers, gorges and the Languedoc National Park. Spain is just 1 hour 30 mins drive away, passing through colourful towns such as Beziers, Narbonne and Perpignan.